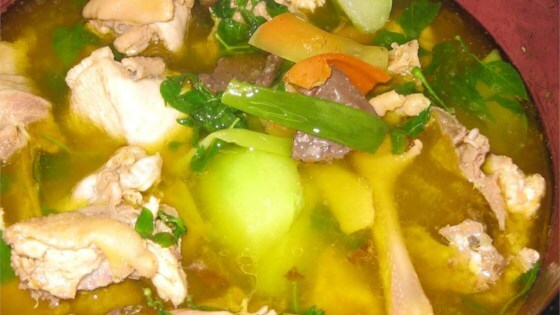 "This is a Filipino dish recipe that my mother taught me and I'd like to share with you. Enjoy." Heat vegetable oil in a large skillet over medium-high heat; cook and stir onions, lemon grass, ginger, and garlic until tender, about 5 minutes. Add chicken and fry until lightly browned, about 10 minutes, turning occasionally. Pour coconut water into skillet and stir in chayote squash. Season with fish sauce. Continue to simmer until chicken is no longer pink in the center and juices run clear, about 10 minutes more.